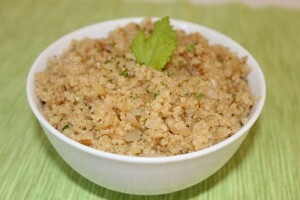 Quinoa is an excellent, gluten-free, protein-rich substitute for pasta. Learn more of the basics in the video below! Rinse the quinoa in cold water through a fine mesh strainer. In a small sauce pan bring the water and Better than Bouillon, to a boil. Add the quinoa. Reduce the heat, cover and simmer for 15 minutes. Remove from heat and let sit for 5 minutes. Fluff gently with fork. In a large skillet, add the olive oil and heat over a medium heat. Add onion and sauté until onions are translucent and carrots are soft about 3-5 minutes, add the cooked quinoa and mix to deglaze flavor. Toss in parsley.